A step by step in building a simple voltmeter. For simplicity, the project will be broken down into three parts. Have you had an issue with understanding how to program ESP32 using Python Zerynth studio and connecting or controlling your device over the wireless network using Zerynth App? This project is meant for beginners to take them a step by step in how to build a simple voltage divider. Part 1: Reading the output volt over the console. Part2: Transform the project to a higher level by reading the result wirelessly using Zerynth App. Part 3: Advance the data reading using a graphical interface from “jqxKnob” element of the JQWidgets. First of all, you need a board. You can select one of the 32-bit microcontroller devices supported by Zerynth. We’ve chosen the NodeMCU ESP-32S a very popular development board with built-in WI-FI for creating IoT projects..
Once you have installed Zerynth Studio and created a Zerynth user, you have to register and virtualize the board. Take a look at the Zerynth official documentation NodeMCU ESP-32S a quick getting started. Now you can start to program your board in Python! This is a very simple python program to read an analog input from ADC port A0 and convert it to real volt value. ADC port is a 12-bit port (2 to the power 12=4096), use the formula volt=value*(3.3/4095) to convert the digital data to a real volt value. Finally, we print the result on the console using the command "print"
At this point, we have completed the first part. You can now uplink the project to your device. Open the console and start changing the resistor value and see the output volt on the console. Part 2: Transform the project to a higher level by reading the result wirelessly using Zerynth App. In this part will send the volt reading data wirelessly to the smartphone in addition to the console. Create an HTML template to read the data from the smartphone. 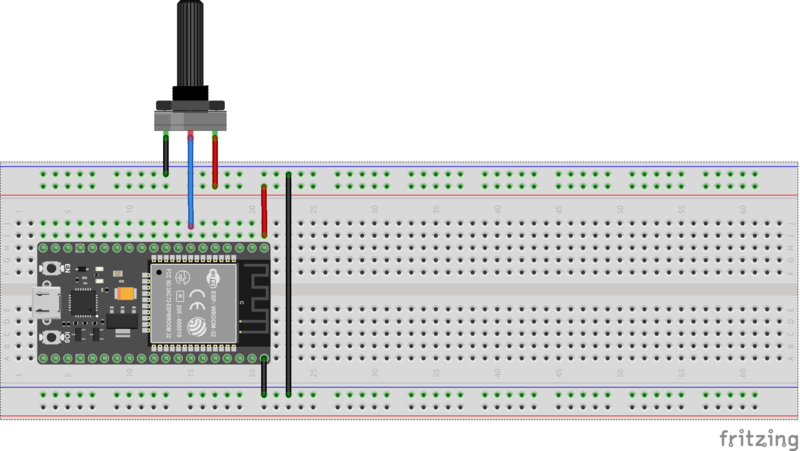 1 - Enable the Wireless on the ESP-32: In order to enable the WI-FI over the NodeMCU ESP-32S, you need to import the WI-FI library and initiate the connection. You can read more about enabling WI-FI under espressif Examples of the Zerynth studio. From the above code, you need to import the Wi-Fi library. In this project, we imported espressif.esp32net since we are using NodeMCU ESP-32S. If you have different development bard, you need to import the right FW-FI library. In the section of WI-FI connection, you will find the code of setting up the ESP32 to connect to your Wireless network. You need to change the "Your WI-FI name" and "Your WI-FI password" with your wireless network name and passcode respectively. At this point, we have successfully connect our ESP32 to the WI-FI, we will go to the next step and configure our ESP32 to connect to Zerynth App. 2 - Connect to Zerynth App: This is the most interesting and fun section where you manage to send your data wirelessly and read it over your smartphone. Second, configure your DEVICE UID and "DEVICE TOKEN. You have to create a “connected device” and link the “zerynthapp” instance to it. Then you have to create and link a template to the connected device. Take a look at the “Create and set up a connected device” and “Create, upload and set the Template” steps of this tutorial for more details. Third, you will need to send your data to Zerynth App with the command z.send_event. This command takes 2 arguments, the first one is the data name and the second the value. The data name is your choice. Fourth, create your HTML template and upload it to the Zerynth server. The basic template is available on the documentation. Upload the THML file and run Zerynth App on your smartphone. Thanks to Luigi Francesco Cerfeda.